SERIES RECORD: This is the fifth meeting between the Aggies and the Cowboys with the all-time record knotted at 2-2. The teams have split the series along home lines, with neither squad winning on the other’s court. NM State beat Wyoming 60-45 in the last contest on Dec. 20, 1997 at the Pan American Center. It’s the Aggies first visit to Laramie since Dec. 10, 1966, when the Cowboys claimed a 77-63 win. MEDIA COVERAGE: Saturdays’s game can be heard live on the Aggie Sports Network and over the Las Cruces radio airwaves on KSNM, 98.7 with Adam Young filling in for NM State Hall of Famer Jack Nixon on the call. The game will also be televised live on ROOT Sports with Jerry Schemmel (play-by-play) and Dave Bollwinkle (analyst). The game will be carried by Comcast channel 77 in Las Cruces. ABOUT THE AGGIES: NM State held Florida A&M to 33 points on Wednesday, the fewest points scored at the Pan American Center and the fewest points scored against the Aggies since March 1952. The Aggies are averaging 84.0 points a game at the Pan American Center this season, while collecting 55.3 points. On the road, NM State is averaging 67.0 points, while allowing 77.0 points a contest. NM State has dropped all three of its road games this season, with all three teams receiving votes in the AP and/or USA Today polls. The Aggies picked up all three wins at home in 2014-15. The Aggies have won 13 straight at the Pan Am, and have are 32-2 at Pan Am since the start of the 2012-13 season. The Aggies’ 13-game home court winning streak is the second longest streak dating back to the 11-12 season. The longest is 15-games, with the 13 and an 11, including the current one. NM State returns honorable mention AP All-American and WAC Player of the Year Daniel Mullings who is currently averaging 12.7 points, 7.3 rebounds and 2.0 steals. Last year, the 6-2 senior guard averaged a team-high 16.8 points per game and led the Aggies with 65 steals, which ranked second in the conference. 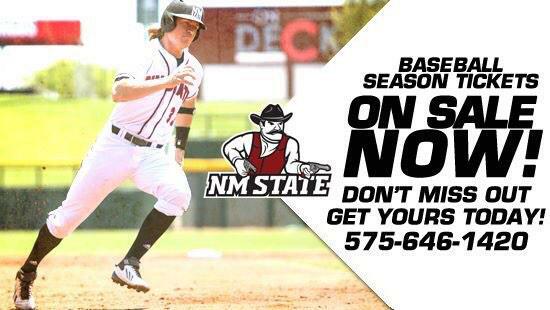 Senior Remi Barry is the current scoring leader for NM State. Barry is averaging 13.2 points a game after scoring 17 points twice, 16 points and 13 points in the last four of the last five games. He just missed a double-double at UTEP with nine rebounds. LOOKING BACK: It was a record night for New Mexico State as the Aggies steamrolled Florida A&M 78-33 at the Pan American Center. The 33 points scored by Florida A&M was the lowest opponent scoring output against the Aggies at the Pan Am and the fewest point allowed by NM State since March 1952. Senior DK Eldridge and freshman Braxton Huggins led the way with 13 points each, while senior Daniel Mullings chalked up 11 points as did redshirt freshman Pascal Siakam. Tshilidzi Nephawe grabbed nine rebounds in the contest that saw every Aggie who played score. ABOUT THE COWBOYS: The Cowboys (5-0) remain unbeaten after their 61-45 triumph over Stetson on Wednesday night. Forward Larry Nance Jr. (6-8, Sr., Akron, Ohio), son of the former NBA standout, paces Wyoming with 12.8 points and 5.8 rebounds a game. Guard Josh Adams (6-2, Jr., Parker, Colo.) adds 9.2 points a game along with 4.4 assists a contest. Guard Charles Hankerson Jr (6-4, Sr., Miami, Fla.) and forward Derek Cooke Jr (6-9, Sr., Washington, D.C.) chip in 8.2 points each. Hankerson grabs 4.2 boards with 4.0 assists an outing and Cooke is shooting 86.4 percent from the floor. Having played all of their games this season at home, the Cowboys are holding their opponents to just 47.0 points a game, while scoring 65.2. LOOKING AHEAD: The Aggies have Rivalry Week next week, starting with the first contests in the Rio Grande Rivalry -- The Battle of I-25 -- against New Mexico. The Lobos are 3-2 on the season, going 1-2 in the Puerto Rico Tip-Off. They host USC on Sunday before welcoming the Aggies to The Pit on Wednesday. The Lobos are paced by guard Cullen Neal (6-5, So., Albuquerque, N.M./Eldorado) who is averaging 17.0 points, 1.3 rebounds and 4.0 assists in the first three games, and did not play against George Mason or Texas A&M. Guard Hugh Greenwood (6-3, Sr., Tasmania, Australia) is averaging 13.2 oints with 4.8 rebounds and 4.2 assists, while guard Deshawn Delaney (6-5, Sr., Chicago, Ill.) is posts 11.2 points with 5.4 boards and 1.1 steals. Center Obij Aget (7-1, So., Juba, South Sudan) leads the team with 5.8 rebounds. The Lobos are scoring 66.2 points an outing, while allowing 61.0. AIR CANADA: NM State guard Daniel Mullings got back into double-digits scoring against the Florida A&M after two games of less than 10-point efforts. But he did collect a career-high 15 rebounds against Stetson earlier in the week. The 6-2, 170 pound senior from Toronto, Ontairio, is averaging 12.7 points, ranking second the team this season. He leads the squad in rebounds with 7.3 per outing and steals at 2.0 per contest. With his 11 points against Florida A&M, Mullings moved into ninth place in career scoring at NM State with 1,481 points, passing Jahmar Young (2007-12) with 1,479 points. Mullings needs 19 points to be the ninth NM State player with 1,500 points and needs 40 points to tie or 41 points to pass Wendell McKines (2007-12) with 1,521 points in eighth on the list. Mullings is also targeting the Aggie record for career steals. He is currently standing second with 214, after passing William Benjamin (1988-92) with 209 swipes. He is just two steals from tying and three from surpassing the NM State record of 216 held by Hearnst Leroche (2008-12). Mullings recorded 65 steals last season (1.9 per game), ranking fifth on the single season steals chart. He is ninth on the career assist chart with 297 and need three more to become the ninth player in school history with 300 assists. He’s five from Brandon Mason (1999-03) with 302 in eighth. Mullings third in both career free throws made (395) and attempted (556) at NM State.